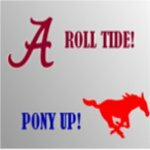 PonyFans.com • View topic - Saints vs Chiefs in Super Bowl? Saints vs Chiefs in Super Bowl? How great would this be. A team with a lot of SMU players (Saints) against a team founded by and owned SMU alums (Chiefs). Re: Saints vs Chiefs in Super Bowl? Apparently the refs, one in particular, had something else in mind. LA_Mustang wrote: Apparently the refs, one in particular, had something else in mind. NFL just admitted the refs blew the call! Insane_Pony_Posse wrote: NFL just admitted the refs blew the call! ......And........the defender said he committed interference in order to prevent a TD. Once a Mustang, ALWAYS a Mustang! Really hate to see a game turn on a blown call... That's a shame for our 5 Saints, but at least Lawler might get a ring. "It's 106 miles to Chicago, we've got a full tank of gas, half a pack of cigarettes, it's dark and we're wearing sunglasses."